COLORADO SPRINGS — The Commerce Department wants to improve the standing of the American space industry in an increasingly competitive global market through a combination of regulatory reform and promotional efforts. Commerce Secretary Wilbur Ross, giving a keynote address at the 35th Space Symposium here April 9, said the underlying goal of his department’s growing portfolio of space activities is to keep American industry at the forefront of a market that could be worth more than a trillion dollars in two decades. At the National Space Council meeting in Huntsville, Alabama, March 26, Ross announced that the Commerce Department would join forces with the State Department for a two-day event called the Space Enterprise Summit in Washington to address space industry competitiveness. That event, he said in his latest speech, will examine some of the domestic and international regulatory issues vital to the growth of the industry. Ross also announced that the U.S. government pavilion at the Paris Air Show in June will showcase the American commercial space industry. The pavilion, which traditionally emphasizes commercial aviation rather than space, will celebrate the 50th anniversary of the Apollo 11 lunar landing this year. Those efforts will include opportunities for international cooperation. “It is important that the U.S. lead in cooperation with our allies,” he said. “By encouraging joint projects we can build the common standards and practices that are essential” to overall industry growth. Separately, Ross said his department is working on a variety of regulatory reform efforts outlined in Space Policy Directive 2. That includes a review of space-related items on export control lists maintained by the Commerce Department, along with a parallel review by the State Department of the more restrictive U.S. Munitions List. An industry day about those planned reviews will take place April 17 at the Commerce Department headquarters in Washington. 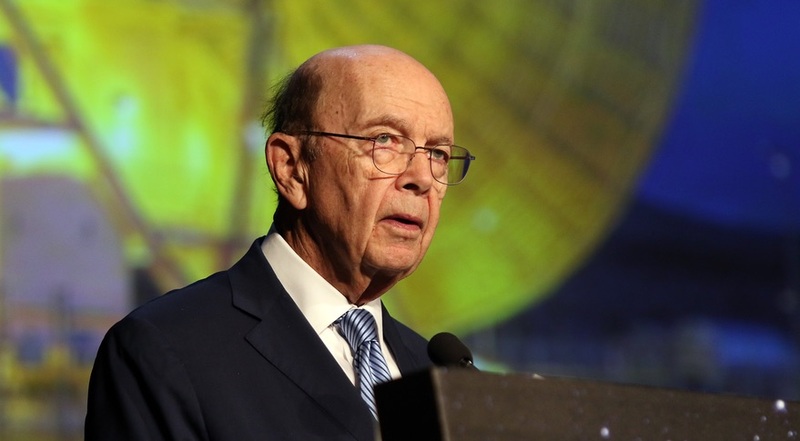 Ross had less to say about efforts to reform commercial remote sensing regulations. While he played up in his speech the work by the department to reduce review times for license applications, a notice of proposed rulemaking that would describe planned reforms of the licensing process, which Commerce Department officials said nearly six months ago was nearing release, remains within an extended interagency review. He suggested in the media briefing that that the delay in the proposed rules was the fault of “a somewhat fragmented” regulatory environment in the federal government. “Each department has a little bit different approach to things,” he said, hoping that the space policy directives issued by the White House would lead to a “whole-of-government approach” to resolve those regulatory issues. Ross said that the Commerce Department, along with NASA, continues to discuss within the federal government concerns that planned use of spectrum for 5G applications could interfere with weather satellite observations in a neighboring band. Ross and NASA Administrator Jim Bridenstine recently wrote a letter to the FCC asking the commission to put a planned auction of that spectrum on hold, but the FCC chose last month to continue with the auction. Ross said at the briefing he was optimistic about the prospects of elevating the department’s existing Office of Space Commerce to a Bureau of Space Commerce led by an assistant secretary. Last year’s Space Frontier Act legislation included a provision to create that bureau, but the bill died in the House. Several senators recently reintroduced the bill with the same language, which the Senate Commerce Committee favorably reported April 3.